SIGCHI is pleased to welcome our new Vice President for Operations Dr. David A. Shamma from FX Palo Alto Laboratory and our interim Vice President for Membership and Communications Dr. Pejman Mirza-Babaei from the University of Ontario. Both Pejman and David move into heading up established committees made up of dedicated, hard working and leading members of the SIGCHI community. These committees devote their volunteer time and energy to helping our community and conferences with their operational needs and support our ability to engage with our membership and communication goals. Dr. Pejman Mirza-Babaei is an Associate Professor of User Experience (UX) Research and Associate Dean Industry Relations at the Faculty of Business and Information Technology. His research and teaching is focused on the design and evaluation of user experience in interactive entertainment systems. He has published more than 50 peer-reviewed articles, and frequently speaks at academic conferences and industry events. He is also a co-editor of “Games User Research” book, a compendium of insights from over 40 experts on UX research in games. His research and professional work is carried out in collaboration with companies spanning the industry. Pejman has worked on pre- and post-release evaluation of more than 25 commercial games including award-winning titles such as Crysis 2, PewDiePie: Legend of the Brofist, and Weirdwood Manor. He also served as UX Research Director at Execution Labs (Montréal, Canada) from 2015 – 2017 and was a UX Researcher at Vertical Slice/Player Research (UK) from 2009 to 2013. 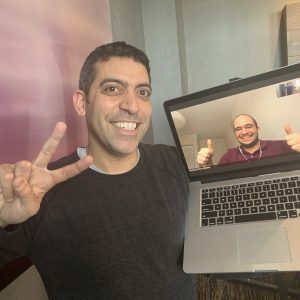 Dr. David A. Shamma is a senior research scientist at FX Palo Alto Labratory (FXPAL) and a Distinguished Member of the Association for Computing Machinery (ACM). Prior to FXPAL, he was a principal investigator at Centrum Wiskunde & Informatica (CWI) where he lead a project on Artificial Intelligence (AI), wearables, and fashion. Before CWI, he was the founding director of the HCI Research Group at Yahoo Labs and Flickr. He investigates social computing systems (how people interact, engage, and share media experiences both online and in-the-world) using AI, systems & prototypes, and qualatative research. Ayman holds a B.S./M.S. from the Institute for Human and Machine Cognition at The University of West Florida and a Ph.D. in Computer Science from the Intelligent Information Laboratory at Northwestern University. He has taught courses at the Medill School of Journalism and also in many Computer Science and Studio Art departments. Prior to his Ph.D., he was a visiting research scientist in the Center for Mars Exploration at NASA Ames Research Center. Ayman’s research on technology and creative acts has attracted international attention from Wired, New York Magazine, and the Library of Congress to name a few. Outside of the lab, Ayman’s media art installations have been reviewed by The New York Times and Chicago Magazine and exhibited internationally, including the Amsterdam Dance Event, Second City Chicago, the Berkeley Art Museum, SIGGRAPH, Chicago Improv Festival, and Wired NextFest/NextMusic. David takes over from Dan Olsen who held a long and distinguished track record of service on the SIGCHI executive committee. Pejman previously served on the SIGCHI Membership and communications committee. Pejman takes over from a long standing member of the SIGCHI executive committee Regina Bernhaupt who will be devoteing her time to co-chairing CHI 2020 in Hawaii as one of the conference general chairs. Now Pejman will serve in an interim role while the former VP for membership and communications before Regina returns after CHI 2020.